What to Teach: Use a Roadmap! Communication is complex. It includes not only the content, or the what, of communication but also what the person means to say and how they say it. There are many pieces of information that need to be considered regarding what and how to teach communication. Every IEP Team is required to consider the student's need for communication. When the team considers communication needs, the process should involve consideration of the skills the student needs to learn to communicate effectively as well as the means for how the student may best communicate. 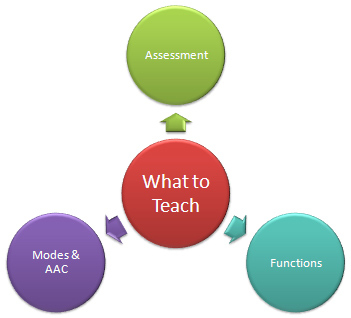 Assessment will give you information about how the student is currently performing and emerging communication skills. Functions of communication will be important to consider as the student will need to communicate for a variety of reasons. This will help us identify a variety of different types of skills to teach to make him or her a more effective communicator. How the student communicates, or the mode, will need to be addressed because not every student will be verbal and will need alternative options. Our students will use more than one mode to communicate. Evidence-based practices must be considered so we are teaching effectively. To learn more about each of these areas, please click on the circles below.